For a camera that does it all, and makes it look easy, it's hard to beat Nikon's Coolpix L120 Digital Camera (Black) .You get a high resolution 14.1MP CCD sensor, a sharp Nikon 21x zoom lens that will carry you from a very wide-angle 25mm all the way to ultra telephoto 525mm (equivalent in 35mm format)--there's really no type of photography (landscape, portraits, parties, travel, wildlife, sports, etc.) that isn't possible with this range. And with 5-way image stabilization and sensitivity up to 6400 ISO, you'll get sharp pictures every time, even in low light or using the longest telephoto setting. Of course, 1280 x 720 HD video is included, with stereo sound--all you need to do is touch one button and you're shooting beautiful video without making any adjustments. A bright, high-resolution (921K dots) 3" LCD display helps you capture and view great images under any lighting conditions. Other great features include burst shooting at 15.3 frames per second for catching fast-moving subjects, modes that automatically detect and photograph a smile, warn you when your subject blinks, and correct redeye automatically. 17 Scene modes adjust the camera settings for different common photo situations, and there are 5 color options for increasing your creativity. Great photos and superb HD movies begin with Nikon's high power 21x wide-angle optical Zoom-NIKKOR glass lens. This powerful zoom lens, with a 25-525mm range equivalent, closes the distance between you and your subjects. Capture your son firing off the game-winning lacrosse shot or your daughter's first ride on a two wheeler. Whether it's a panoramic shot of the entire family on a favorite sledding hill, or a photo of your children playing in the backyard, you'll shoot effortlessly and accurately with the COOLPIX L120.If you're new to photography, no worries, this camera has intelligent features to help you out. Five-way VR Image Stabilization uses sensor shift to minimize the effects of camera shake, virtually eliminating blurred images. Trick-or-treating with the kids? The COOLPIX L120 has a high ISO speed up to 6400 to capture fast moving or low-light scenarios. Versatile 25-525mm lens ranges wide to capture landscapes, zooms in to get close for superb portraits and great action shots. Low-light conditions and fast action can defeat some cameras, but not the COOLPIX L120. With high ISO speeds up to 6400, you can be sure that still images and movies will be ideally captured. With Nikon's Sport Continuous Shooting mode, this camera takes photos continuously and in quick succession to capture fast moving objects.You'll get great use of the in-camera editing functions, including D-Lighting for adjusting contrast and fine details often lost when shooting in glaring or intense light. You can pick from five color options: Standard, Vivid, Black & White, Sepia and Cyanotype. And when you want to take close up photos, the COOLPIX L120 will zero in as close as 0.4 inches. Don't hesitate to click away, because you'll get about 330 stills from the four AA alkaline batteries that come with the camera. Hybrid VR Image Stabilization--by combining sensor shift and electronic stabilization minimizes the effect of camera shake. VR Image Stabilization--by sensor shift minimizes the effects of camera shake. Motion Detection--automatically detects moving subjects and adjusts shutter speed and ISO to compensate for camera shake and subject movement. High ISO--up to 6400 for optimum results when shooting in low light or photographing fast-moving subjects. (reduced resolution). Nikon's Best Shot Selector (BSS)--automatically takes up to ten shots while the shutter is pressed, then selects and saves the sharpest image. You'll enjoy composing images from the COOLPIX L120's bright three-inch LCD color display, which features a dazzling 921,000-dot screen that showcases still images and HD movies in rich detail and enhanced contrast. And for easy photo composition, improved picture viewing, and instant sharing, the LCD monitor's wide viewing angle and anti-glare coating lets you capture and view high quality images in virtually any lighting condition, every time. EXPEED C2 continues to expand the possibilities of photography with improved levels of image quality, fine detail and processing speed. Custom-optimized for each COOLPIX model, Nikon's renowned digital image processing engine ensures outstanding images. One-Touch HD Movie Recording Puts Friends and Family in Motion. As photo keeper of family memories, you can rely on the COOLPIX L120 to capture great still images that you can print and save. But a band concert without sound is incomplete and a 60-yard touchdown drive without the fleet-footed runs isn't as exciting. That's where the COOLPIX L120's advanced One-Touch HD Movie recording capabilities come in. With the push of a button you'll instantly be shooting 720p HD movies in full stereo. While shooting you can activate the camera's zoom function to capture tight shots and close ups. And when you're ready to share your movies with family and friends, you can use in-camera playback or the convenient HDMI output for simple hookup to an HDTV or computer. Behind every great photo and HD movie is the COOLPIX L120, a camera brimming with technological advances. Smile Timer detects when a subject smiles and automatically takes the photo. Blink Warning identifies when a subject may have blinked and signals you to retake the shot. Face-Priority AF is an innovative face-identifying technology that detects and focuses up to 12 faces automatically.Red-eye will no longer ruin family photos. In-camera Red-Eye Fix automatically fixes the problem before it occurs. Blotchy, uneven complexions are also a thing of the past with COOLPIX L120's Skin Softening, which smoothes skin tones. This versatile camera also has 17 Scene Modes that adjust camera settings to selected scenes, assuring great pictures at school plays, backyard barbecues, or athletic events. Automatically adjusts camera setting to specific scenes just point and shoot, and includes New PET scene mode which finds the face of dog or cat and tracks and focuses automatically. 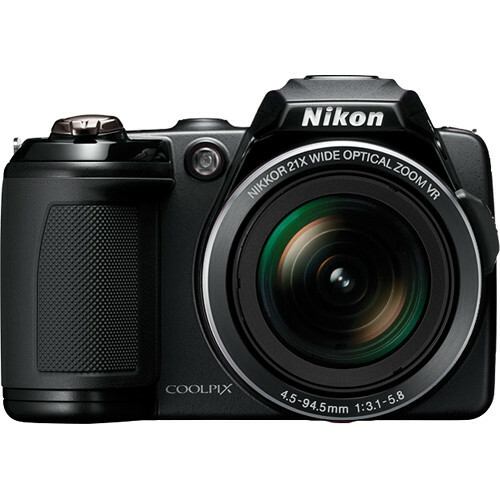 Box Dimensions (LxWxH) 8.0 x 5.5 x 5.5"
Coolpix L120 Digital Camera (Black) is rated 4.4 out of 5 by 126. Rated 4 out of 5 by Anonymous from Just right! I bought this for my mother who wanted digital SLR-like functionality without the weight or complicated controls. It does the job. It's no digital SLR but comes close in most routine photos. Extra zoom is a plus. i like the fact that it uses AA batteries since we have a habit of losing chargers. So far the only function that I don't particularly like is the sports or continuous shooting mode, which does not work that well. maybe I haven't quite figured out how to optimize the settings for it. In any case, I doubt my mother will ever feel the need to figure out how to turn that function on anyway. Rated 5 out of 5 by Anonymous from Great little camera This camera is a great little camera, especially for the price point. Owning a Nikon D300, it was a step down for sure, but does work out quite well in more of a point and shoot environment. I like the flash having a similar release as the D300, thus not forcing me into turning off the flash using the software. The video record function is nice, not needing to go through a menu to shoot, just pushing a button and going. Again, it's not a DSLR, but it does certainly do the job in terms of zoom and picture quality. I also like the usage of AA's as well as Nikon batteries. It allows a much easier trip to no-where, without worrying about chargers and/or even a place to charge out in the wilderness. Of course it means having batteries to bring, but that's a price to pay for the ease. Rated 5 out of 5 by Anonymous from Excellent all-around camera As an amatuer photographer I found this to be an excellent camera for a great price. It has features that make it superior to most point and shoot cameras such as the superior wide angle optics, 21X zoom capability, excellent image stabilization and high speed sports mode, but is still simple to use. I have not had it long and am still discovering the extent of its capabilities. The only thing that I have found to be a slight problem is that the battery life is shorter than preferred. Rated 5 out of 5 by Titito19 from Best in Class, Great Camera ! This was a Mother's Day gift to my wife. The camera is awesome, fast, the resolution is great, as is the quality of the pictures. It has a lot of great features, the zoom is really good and it's a powerful camera. Also, the price is really good, even better if you get one of the bundles. The camera although not really complicated to use, is not the easiest one in terms of how to use all the features it has. In general, this is definetly one of the Top Point-and-Shoot cameras in the market right now. Rated 5 out of 5 by Anonymous from Great deal on a great camera! I've only owned the Nikon Coolpix L120 for two weeks now and so far I really like it. This is only my second Nikon that I've ever owned. The first was a Nikon SLR I had back in the 80's that I really liked. The camera is very easy to use and it takes great pictures. Even though the manual is in PDF format I own a printer that can print out in duplex mode, which means I can print out the entire manual with half the paper. I recommend reading the manual as it has a lot of information on how to use the different scene modes. I thought it was great that the camera came with 4 Energizer Lithium batteries. These are the best type of batteries that you can use as they will last a very long time.